From Academy Award winner Steve McQueen, the director of '12 Years a Slave', and from Gillian Flynn, the writer of 'Gone Girl', comes a powerful thriller with a stellar cast, including Oscar Winner Viola Davis, Michelle Rodriguez, Elizabeth Debicki and Cynthia Erivo. Four women — with nothing in common except a debt left by their dead husbands’ criminal acts — conspire to take fate into their own hands. Also featuring Colin Farrell, Robert Duvall and Liam Neeson, 'Widows' delivers explosive action and gripping suspense! 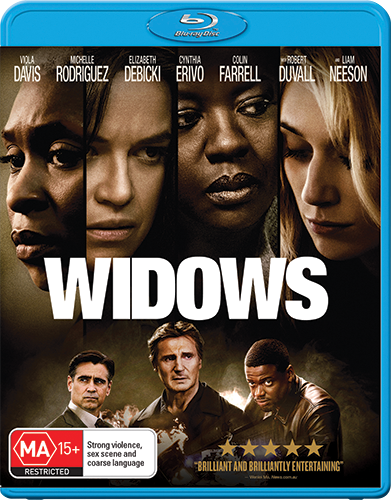 The Blu-ray is packed with nearly 60-minutes of bonus content, with three documentary featurettes filled with in-depth interviews and raw on-set footage detailing the compelling production story of 'Widows'. Click here to read our home entertinament review of 'Widows. The 'Widows' competition has now closed. Winners will be announced shortly. Competition opens at 5pm AEDT on Sunday 24th February 2019 and closes at 11:59pm AEDT on Sunday 3rd March 2019. Five winners will be chosen at random on Monday 4th March 2019. To successfully win, entrants must fulfil the above entry conditions before the time the competition closes. Current members/followers are eligible to enter the competition. Only one entry per person. Only one winner per household. To be a valid winner, the entrant must not have won a prize from SWITCH within the last 28 days. Each winner will receive one Blu-ray copy of 'Widows'. By entering, you agree to receive occasional emails from SWITCH in the future. If you decide to unsubscribe from these updates, any further entries will not be applicable. Only Australian residents are eligible to enter. 'Widows' is available on 4K Ultra HD, Blu-ray, Digital and DVD on Wednesday the 27th February 2019 from Twentieth Century Fox Home Entertainment.